Introducing URB-E's New Front Vertical Kickstand! Go ahead, fill your basket and never have to deal with parking at Trader Joe's again. Introducing the patented Front Vertical Kickstand, available now from URB-E. Make the URB-E your perfect companion on subways and buses, at grocery stores and pharmacies, and everywhere the URB-E needs to be stopped or stowed with ease. 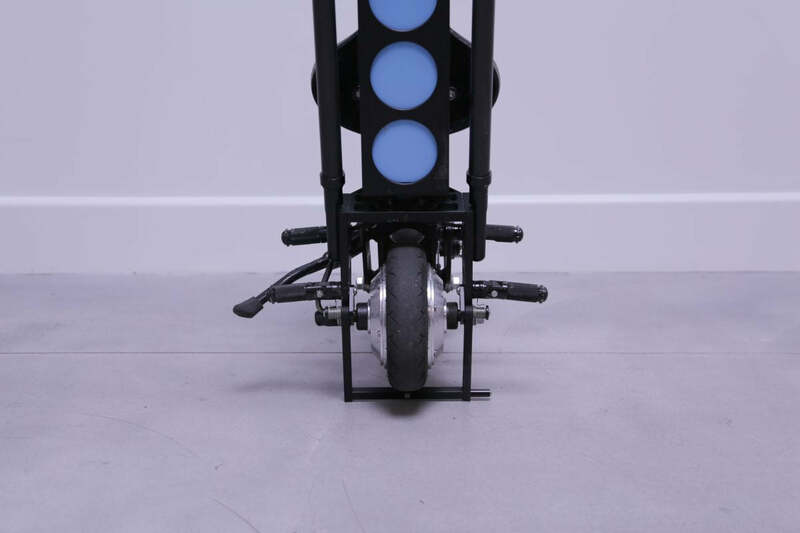 The front vertical kickstand allows each URB-E to stand up perfectly straight when folded, creating a sturdy platform for you to load it up or tuck it away. American innovation enables the URB-E to literally stand on its own. Find it in our online store here, where it is available now for order! To purchase a Front Vertical Kickstand all you have to do is add it to your cart along with the URB-E of your choice, and our production team will install it for you. Easy! Any questions? Chat with us, email us at info@urb-e.com, or give us a call in Pasadena at 626-460-8113. Hands free shopping has never been this easy.... The new kickstand attaches around URB-E's front wheel. When raised, it sits flush against the front fork, held in place by an invisible magnet. 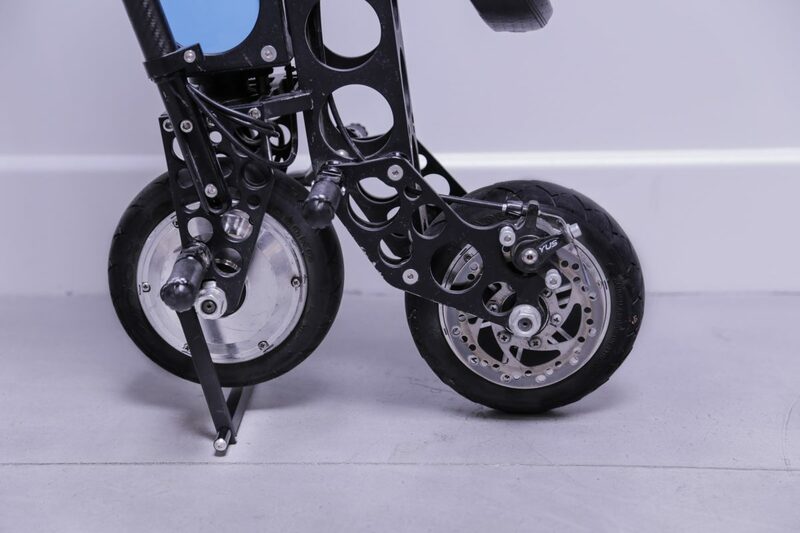 With the touch of a foot, the kickstand lowers to prop up the front wheel and hold the URB-E stable in the folded position. Go Ahead, Fill your Basket! 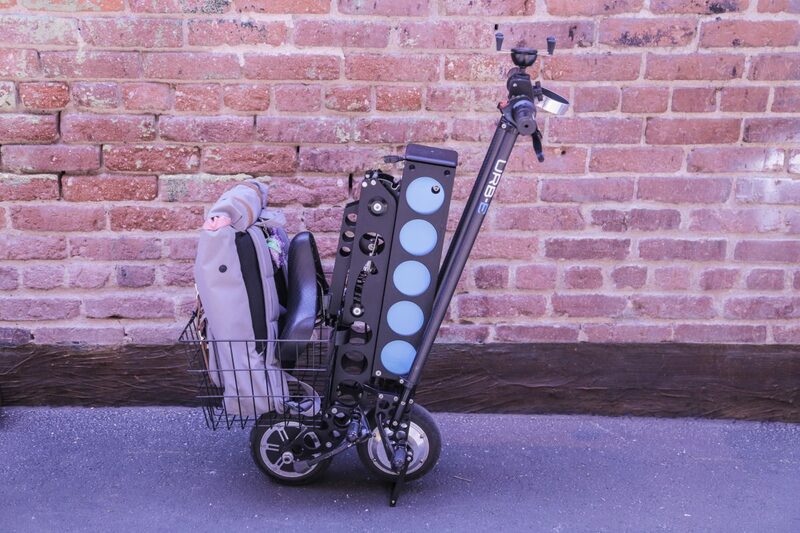 The front kickstand stabilizes URB-E even with the basket attached, making it ideal for hands-free shopping. Your URB-E will stand on its own, leaving you both hands free to fill up on shampoo, cereal, or farmer’s market produce. The front kickstand also keeps full cupholders and gadgets level when you need to let go of your URB-E, so you’re free to step away at a moment’s notice. URB-E’s compact size already makes storage easy, but the new front kickstand allows you to stand URB-E upright next to your desk or in a corner, even when space is tight. At URBAN626, we’re dedicated to solving the pain points of urban transportation. That means developing accessories that help URB-E fit seamlessly into your day-to-day life. We receive feedback from customers all the time, and we are always striving to make URB-E a better, more versatile product. Designing and producing URB-Es right here in Southern California gives us the freedom to develop and test new ideas constantly. The front kickstand–like all our accessories–is the product of much hard work and prototyping, all focused on revolutionizing the way you get from A to B. Want a front kickstand for your URB-E? Visit our accessories page, call us at , or email support@urban626.com. Click Here to Order Your Vertical Front Kickstand Today! If you’re nearby, we’ll install your kickstand in our Pasadena shop. Otherwise, follow the step-by-step instructions to install it at home.